HABIT: Moderate, large conical shape, pointed to drooping top, foliage to the ground, foliage consists of small pine-like needles. CULTURE: Any soil, good drainage, plenty of room. USES: Parks, large estates, evergreen back drop. PROBLEMS: Too large at the base for most residential gardens, freeze damage, diseases, bagworms and red spider. 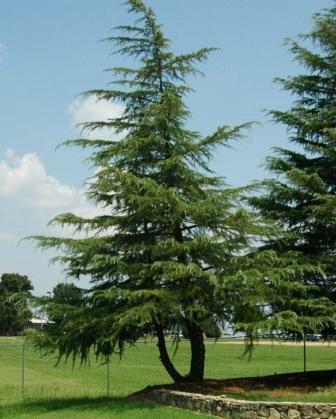 NOTES: Sometimes called “California Christmas tree.” Graceful when healthy but I would not invest much money in this plant in the northern part of the state. Native to the Himalayas.